I began this blog a year ago! In that time I have had over 100,000 visits, learned about many things that I had always been curious about, sharpened my photography skills (still a way to go on that one!) found some spectacular purveyors of food, drink and scents and met many wonderful blog friends who have been tirelessly supportive and generously shared their enjoyment of life in general and food in particular. 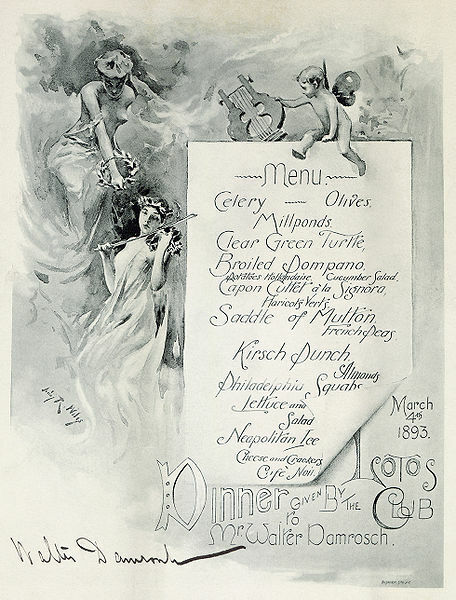 The whole idea of Lost Past Remembered began in 2008 when I discovered a cache of 19th century menus at the Player’s Club in NYC. From there a blog was born. I began to make things I had always wanted to make and share old favorites from my personal recipe stash, realizing that in choosing my blog’s name I had given myself a gigantic playing field. At this point the 90’s are history, aren’t they? In honor of this milestone, I thought I would revisit my first post and create the whole menu that was served for Mark Twain in 1906 since the first post was all talk and no cooking (I had made Nesselrode Pudding the Christmas before, sans photos). Because of the number of dishes, the post will come in two parts. Most of the recipes have come from Delmonico’s 1894 recipe book, The Epicurean by Charles Ranhofer, as it was a familiar favorite restaurant for Twain. As I said in my first Twain post , this was a welcome-back dinner and for it the Player’s pulled out all the stops. Twain quotes were used throughout to illuminate the menu. 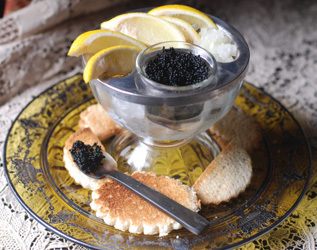 To start, caviar. From Ranhofer’s description of cavar in The Epicurean, it has changed somewhat from what we eat today. It was more like pressed caviar and although the US produced its own excellent variety, the preferred source, then as now, was the Caspian Sea. Served with lemon and onion, as it would have been 100 years ago, it is still a great way to start out a grand occasion as the accompanying quote in the menu said; “ it is peradventure that manner of thing which of late the unbelievers have brought from over the great seas? You bet… sturgeon eggs are that and so much more. The Beluga sturgeon is the rarest Caspian Sea variety. It can live to be 100 years old, grow to 30 feet and weigh up to 1800 pounds. It takes 20 years to mature and produce roe. Before the fall of the Soviet Union, the catch was strictly monitored. Without this protection the magnificent Beluga sturgeon will soon be extinct thanks to an explosion in illegal poaching (take care that you know where your caviar comes from before buying, -- encourage legal sources by buying from them). Next, Oysters, “A blowout ain’t anything as a blowout unless a body has company” said Twain. Oysters were served simply with shallots, lemon and salt and pepper at the turn of the century (I added tarragon). That hasn’t changed -- they are still best served that way. 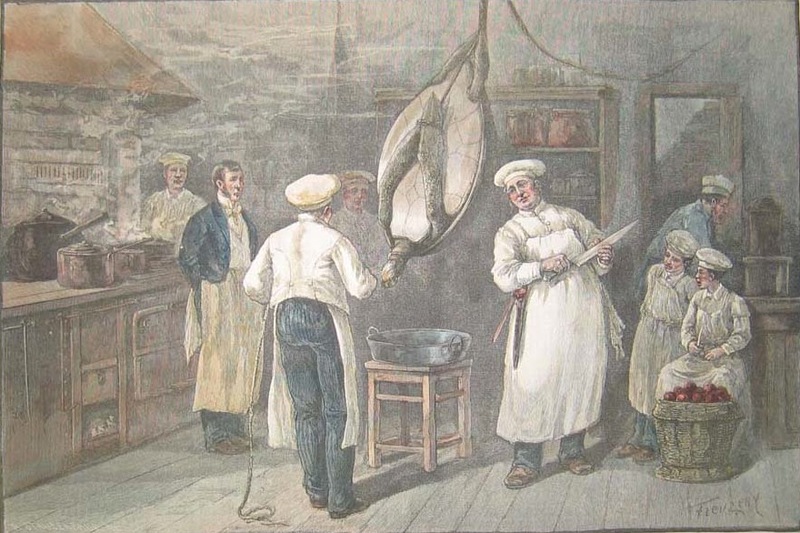 In the 19th century oysters held a peculiar place on the New York food chain. 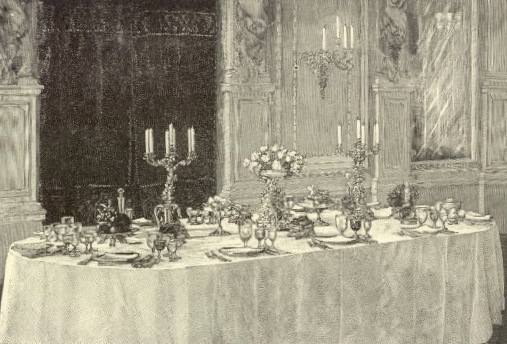 Plentiful enough (on any day in the late 19th century, 6 million oysters would be harvested from NY Harbor) that poor people could eat them, yet given a Minton dish and silver fork, equally at home in a very elegant dining room. Sadly, by the early 20th century, oysters were gone from the harbor due to pollution and over-fishing and were imported and only consumed by the wealthy. Also at table would have been celery dishes -- long, heavy, cut-glass celery dishes. I remember this from my grandmother’s table as a child. At any large dinner there were always cut glass celery dishes with radishes and accompanying salt dishes. It is easy to forget that my grandmother would have been in her 20s in 1906… this was her youth! All of the old-fashioned ways she had were born in the turn of the 20th century. In 1906, no fine meal would be complete without turtle soup and the Twain quote for it on the menu read ""We had a soup that had something in it that seemed to taste like the hereafter, but it proved to be only pepper". Green turtle was a dish for the rich in New York and was seen either on its own or in a soup. The green sea turtle was so named because of the yellow-green tint to the fat of the under-shell called the calipee, and green calipash gelatin from the upper shell that gave it a special flavor and gelatinous texture. The green turtle averages 2-6 feet in length and 300-400 pounds when fully mature and lives in warm, tropical areas. According to the NYTs, a private cook would procure a small 30-pound specimen for home use. It was on every menu of the fine restaurants, private clubs and well-to-do homes of the day. Today it is a protected species. 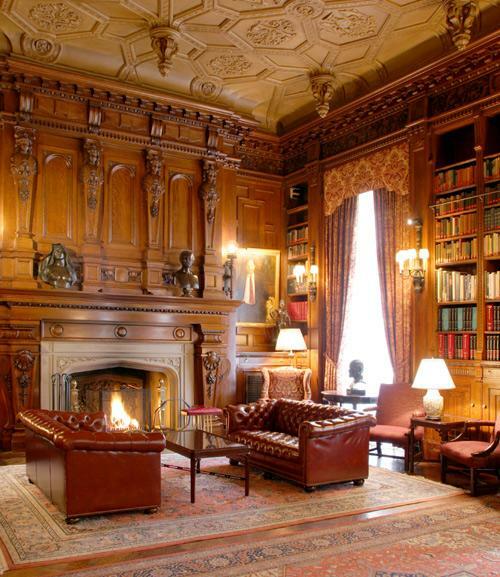 Like the Players Club, The Lotos Club was begun by Twain and others to cater to writers and journalists and friends of the arts toward the end of the 19th Century. 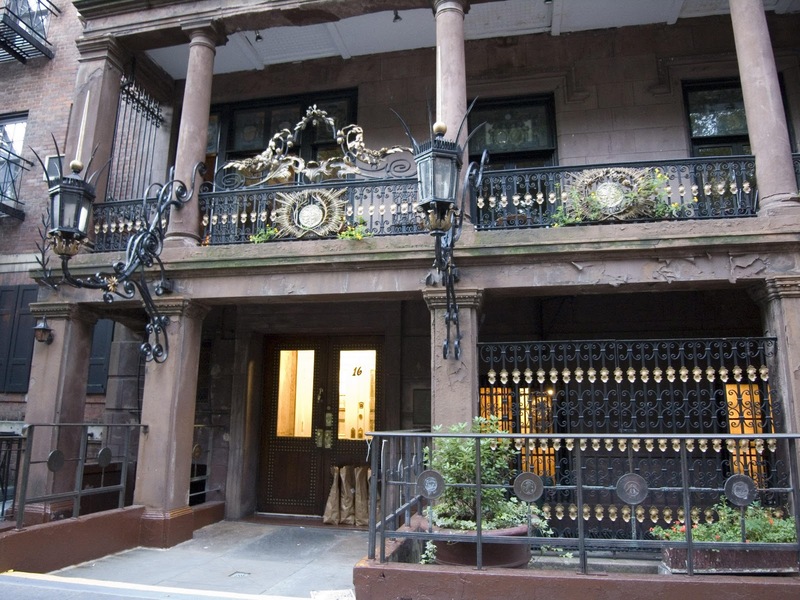 By the time I visited, it had moved into a beautiful townhouse on 5 E 66th Street. I ate the turtle soup reluctantly at a meal there (I had a pet turtle as a child so eschewed eating the little beasties in memory of my beloved pet). What I remember most about it was that it had an amazing green color, a slightly viscous texture and that was perfumed with sherry. I felt guilty about it, but it was delicious and seemed very sophisticated to my young eyes. 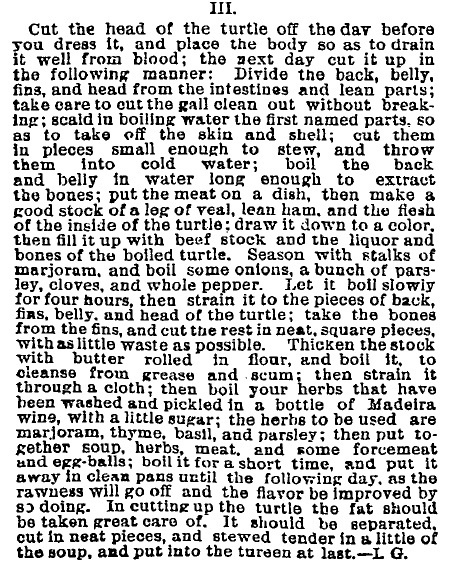 For this menu, I made “mock turtle” using ideas from an 1891 NYTs recipe since green turtle is off-limits. The green color and flavor I longed for was arrived at with the help of soaking herbs in Madeira… brilliant idea. I wanted it greener still so just before serving, I put it in the blender with more herbs, strained it and, voilá -- there was the perfect calipash-green I wanted. The soup is light and delicious. My biggest pointer would be to use homemade stock. The packaged stuff will not work… and will give the soup an “off” taste. Mock turtle is usually made with veal stock, a stock made with calves head to give the soup the gelatin it needs to be more like turtle soup (sorry, no calves head this time!). Turtle was an expensive delicacy in the 19th century, but the new middle classes loved the idea and mock turtle was born and became extremely popular. 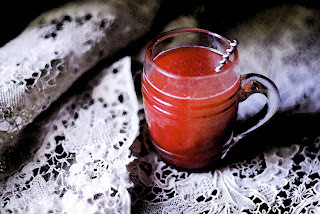 These days you can add a little gelatin to rich stock and get the same effect should you not feel like boiling a head! It is slightly thickened, not aspic like. Marinate the herbs in the Madeira for a few hours or overnight. Put stock, ham herbs onion cloves and salt and pepper in a pot and simmer for an hour or 3 if using a ham bone. Strain the stock, skim any fat and blend with the butter. Add the herbs from the Madeira, reserving the Madeira. The NYTs recommends leaving it overnight at this point to lose the raw taste. Just before serving, heat the soup, add the gelatin then remove a cup of stock and blend with the extra herbs. Add this back into the soup, strain, adjust seasoning (adding some of the herb scented Madeira if needed) and serve with a lemon slice in each bowl. If you’ve never had them, you are in store for a treat. I know everyone always says this -- but they are chicken-like with a hint of troutiness, very delicately flavored with a texture like chicken wings and wonderful in this deviled style that really needs a renaissance. If you can’t get them, this works beautifully with chicken wings. If the sauce is too much for you, a good ketchup with a little horseradish would be great with these fried frogs legs. The deviled crumb is a little unruly but delicious. Season frog’s legs with salt, pepper and nutmeg. 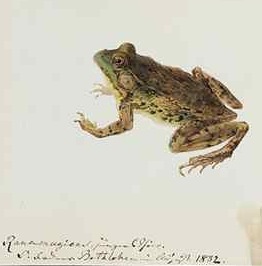 Combine mustard, lemon juice and butter and coat the frog’s legs with it, then roll in bread-crumbs. Broil for 10 minutes turning once until browned and serve with Deviled sauce. Cook the vinegar, shallot, herbs and garlic for a few minutes. Allow to steep. Strain and add the rest and serve warm. After that came sweetbreads, “The precious juices of the meat trickling out and joining the gravy archipelegoed with mushrooms.” This is a complex preparation. It is best done in pieces. I hadn’t made an espagnole sauce in years but there’s a reason it’s called a mother sauce. Saute the sweetbreads in butter, remove and keep warm. Saute the mushrooms in the butter. Add the artichoke and foie gras and crawfish tail or shrimp and cook till done. Return sweetbread with truffle slices to pan and coat with sauce. Put a toasted circle of bread on the plate. Arrange mushrooms, foie gras and artichoke on the plate. Place sweetbread, quenelle and crayfish/ shrimp on the toast and nap with remaining sauce. Reduce espagnole, stock with truffle pairings till thick then add Madeira, slowly. Strain and use. Saute butter and flour slowly over low heat until dark brown… do not burn. Add stock and tomato paste and cook for an hour or so until slightly thickened. Add the demiglace. You should have around 2 to 2 1/2 cups. Combine ingredients in the food processor and blend. Put into small, well buttered molds. Sit in a saucepan with boiling water coming up to 2/3 of the sides of the mold ( you will have a little extra). Cook on a low heat for 10 minutes and unmold. Melt butter in water and stir in flour till well mixed and the mixture pulls away from the pan. Remove from heat and add the eggs one at a time, stirring rapidly. Remove what you need for the recipe and get the bonus of little puffs! Pipe them on a parchment lined sheet pan in a 425 oven for 20 minutes. Remove, poke with a toothpick to remove steam and cool… pop in the freezer and you can make a quick dessert any time! Next comes the palate cleansing sorbet, “a little punch behind”. For this I chose Maraschino Sorbet: made with lemon ice, maraschino liqueur, a little pureed sour cherry and punched with sparkling wine. Take the lemon ice mixture and combine with cherries. Cook for 10 minutes until cherries are cooked. Push the contents through a fine mesh strainer, add maraschino and egg white if you choose and freeze. Boil the sugar and water together and reduce a little to a syrup. Add the lemon juice and peel and put in the freezer. If using in the cherry sorbet, stop before freezing. Stay tuned for next week… squabs and Nesselrode pudding, a chestnut ice cream with a maraschino cream for the grand finale of the Mark Twain Dinner!!! Special thanks to all of the purveyors who have made my exotic dishes possible through their generosity and sharing of expertise. I couldn't have done it without them! Lastly, a special mention to Ken Albala, food historian extraordinaire, who encouraged me to go to Oxford and has helped me get things right with his love and knowledge of history. to be able to hobnob with so many passionate food and wine lovers. Oh my gosh you have worked hard..I love the menus..so vintage ephemera..I had turtle soup once Somewhere close to Buck's County .. and of course frog's legs many yrs ago.. Your sense of history..your knowledge.. is astounding. Very well done and Happy Anniversary.. It is amazing how we do get to meet to many wonderful people..sometimes in person too..
What beautiful food! That is so much work to complete all of those dishes. Also congratulations on the success of your blog. 100,000 visitors is amazing. What a wonderful post. Your menu is stunning and I would love to taste all those lovely dishes. When I was a child there was always a celery dish on my grandmother's table. What a nice memory. Oh Deana, happy blogversary! Your blog is so cool. I can see why you've had so many visitors. And this menu looks wonderful. Believe it or not, this vegetarian wants a bite of frog leg (smile). Oh, and that chicken dish is beautiful too! HAPPY ANNIVERSITY! What a FANTASTIC job you've been doing with this blog! So howsabouta book? I'm happy to pimp it for you. Deana, your visit and comments are always a refreshing addition to my world, truly. And then when I come here, OMG; a feast not only for the belly, but for the soul and heart of what we all love to do and what brings us together: FOOD! OH YEAH! ANd what panache and flair you serve up these meals, with the polish and care in your writing. Have you ever been published in a food magazine? If not, you really should be doing that...you are extraordinary. Again and as always a fascinating read. Congratulations-- keep up the amazing work-- I love coming here!! It's amazing how quickly a year passes! I've so enjoyed your historic meals and posts. I've learned so much and I've loved delving into our culinary past with you. Happy anniversary for this wonderful blog. May you have many many more years of fulfilment in blogging. You have done some amazing work crafting this lovely menu. Kudos to you for the hard graft. An absolutely breath-taking feast... and gorgeous to look at. This is an amazing, unique blog. Keep up the good work! PS: As you may know, Twain's complete, unexpurgated autobiography has come out. Well worth a read! I so love this blog - just wanted to note quickly: that is the most exact description of frog legs I have ever heard or read. I usually describe them as "somewhere between fish and chicken" but will be switching to "a hint of troutiness" from now on. I am such a fan of your blog, congrats on your one year anniversary. This meal looks like quite an undertaking, but dont worry, my belly can handle a lot of food :D (what can I say, it's a gift). Can't wait for desert! Your title reminded me that a month or so ago, the big city just to the south of me selected a Mark Twain book for that month's "Scranton Reads" selection. They always have a big do at the end of the month, and try to invite the author, however, despite his quote to the contrary, the reports of this author's demise had not been exaggerated. They had a substitute who dressed up as Twain and read some. They also sponsored a bus trip to his house in Scranton. It probably was not as good as your Mark Twain meal, but there it was. Congrats on one year of entertaining us! You have one of the most interesting blogs I know: so literary and filled with interesting titbits. Congratulations on your blog's success and anniversary. Thank you for the mock turtle soup; I met some ladies who take care of these turtles! I've been to the Player's Club...haven't eaten there though. My kids' great great grandfather was Lawrence Barrett. There's a painting of him there. Your posts always hit me with familiarity! However, I'm not familiar with the Lotus Club. I sure am loving the food though. Can't wait to try frogs legs done this way....the sweetbreads look divine as well. Interesting maraschino sorbet....not sure I could get my family to eat it though. Happy Anniversary, my dear friend. You are a smashing success!!! What a fabulous post...as are all of your posts! I've enjoyed your postings for close to a year now and would hate to have to pick my favorite! This one would certainly be high in the running! 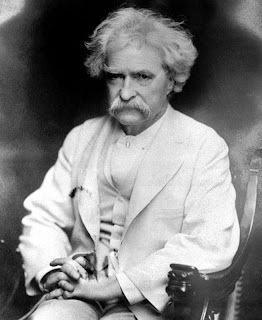 My book group, The Muses, recently read a biography of Mark Twain which led me to reread "Tom Sawyer". 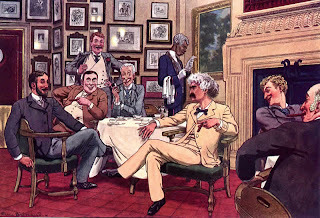 How I would have loved to have had this meal with Twain! By the way, I order sweetbreads every time I find them on a menu. I've never seen them in the marketplace. How fascinating. I enjoyed reading all of this along with viewing the vintage ephemera and looking at the delicious food. Where do you find the time?!? Everything looks amazing, and I love the history lesson. 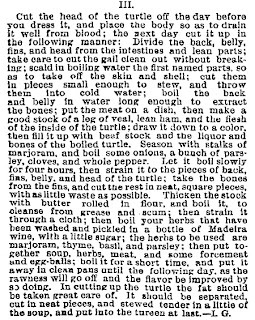 Funny, just yesterday I watched a WGBH show replicating a large Victorian meal from the recipes of Fannie Farmer. They made Mock Turtle Soup and boiled the calves head. I vowed then to never eat it. Glad you posted an alternative! The show was very interesting...you'd love it. Mark Twain is a favorite here. His autobiography is due out this month. He didn't give permission to have it published until 100 years after his death. Now that is control! Can't wait to read it. Thanks for all that you do and congrats on your milestone. Congratulations, Deana, on your anniversary and the continued high quality of your posts. Continued and greater success to you as you begin your second year. What a perfect time to celebrate Mark Twain, especially with his autobiography making the rounds. I really wasn't aware of his favorite haunts in NYC, although I have visited his home in Connecticut. The menu and your results are extraordinary - particularly the frogs legs. I once did some research on Turtle Soup and remember reading that it was so extremely popular in early America that eventually the turtles became endangered. This post is nothing short of a masterpiece, everything is so perfectly put together. I love how you made Mark Twain's meal, what a great idea! And the food is really fantastic...my hubby would go crazy for the sweetbreads! Congrats on your one year anniversary! Can't wait to see what the future holds for your lovely blog! Fantastic post and what a spread! Happy bloggiversary! I always love coming here and reliving the past with you. I love that I always learn something. These recipes look delicious! What a variety. Congratulation on your one year anniversary! how time flies right?.. thanks for sharing this beautiful post. i really love the frog legs. You have worked hard! The menus are intiguing. I had turtle soup on my honeymoon. It was fabulous. My dad brought home bullfrogs once upon a time...and we had frog legs. They were delicious. I appreciate your replicating the menu...love the history!! Happy Blogoversary! What an incredible meal, and how fun to re-create it. The oysters look fantastic, and you had a great idea in making a mock green turtle soup. Can't wait to see the rest of the meal! When cooking squab in the cast iron skillet, do you leave the skillet out of the oven because it is so hot or do you put it back in? Do you cover it? Thank you for the great recipes. You put a lot of work into this.